A little bit of sparkle lends a lot of style to these glamorous wedding invitations. The gold glitter border frames your wording beautifully, and it's all you need to make a statement with your wedding invitations. Your wording is printed in your choice of colors and fonts. 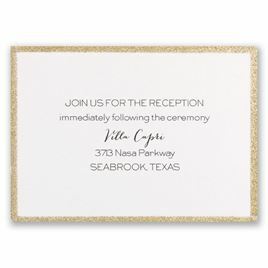 These invitations feature thermography printing - a unique printing technique that results in raised lettering you can feel, which adds to the luxurious experience of this printed piece. The matching inner envelope liners shown are sold separately. Absolutely fell in love with this invitation. It's elegant and the ribbon really adds a unique touch. Customer service was wonderful and made my ordering experience wonderful. I will definitely recommend this company to my friends and family. These were perfect and exactly what I was looking for. I received my whole order rather quickly. The only con was that I wished I could have customized the color of the ribbon. I ended up buying pink ribbon at a craft store and using that instead of the black ribbon that came with the ribbons. Otherwise they were beautiful and good quality. I ordered about 120 of these invitations in the gold glitter border and black font. It comes standard with black ribbon. You can not use it but it gave more elegance to the invitation. the paper quality was good, which I was worried about, its the perfect thickness. The entire thing shipped for 71 cents, with the inner envelope with a colored liner. Only issue I had was all my response cards the print was a bit lop sided. Which was very annoying. a few envelopes were also smoothed and messed up, and about 5 invitations were messed up as well. I had a few blank ones, and some with ink smudges. When I called they were able to fix the issue immediately and ship out within two days. she said she would get it to me in 2 days but that didn't happen and i and to wait about 5 days to get them. so thats why i gave 4 stars.